If you’re a woman who spends her working day in hazardous environment, then a suitably-rugged pair of ladies' safety shoes are an essential purchase. This section of the site is home to all our work shoes for women. 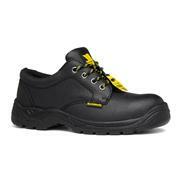 They’ll provide the protection, comfort and durability that working with heavy items and machinery demands. The women’s work shoes we provide are made from high-quality materials that’ll withstand even the most punishing situations for years to come. If you’re looking for protection for your toes, then investing in women’s steel-toe-cap boots is sure to be a worthwhile move; you’re sure to be especially glad you made it the next time something heavy falls on your feet! By the same token, if you often find yourself in a slippery environment, you’re sure to be grateful for an outer sole that’s high-grip and shock-resistant! While considerations like looks and style are important, these shoes emphasise safety and practicality above all other criteria. Ladies’ work boots from Shoe Zone come in several different styles, but they all share the same commitment to protection. What’s more, they come at affordable prices, so everyone can be safe! 5 products from £16.99 to £24.99.